We spent over 48 hours testing and researching 12 different types of trail cameras and found that features, cost, and picture quality were the most important things consumers look for when they are shopping for a trail camera. The Foxelli 12 MP Trail Camera scored high marks in all areas and is our overall top pick. The Foxelli trail camera is super easy to set up and offers users 12 MP that produce crisp, sharp photos with a 120 degree shooting scope for wide shots. Hunters and other outdoor enthusiasts love the 2.4 inch color display monitor that allows them to preview videos and photos. Trail cameras can be really intimidating when you are trying to make sense of all the features and options that are available. There are dozens of different kinds on the market with prices ranging from as low as $50 to as much as $500. If you don’t know what to look for you can easily purchase a camera that will not provide the quality and features you are looking for. If you want to find a great quality trail camera that will allow you to capture the beautiful nature you are in and its inhabitants you will need to know what you should look for and what information you should be aware of when sorting through all of these selections. We have provided you with reviews of the three top rated trail cameras below so you can learn more about these three selections to see if any one of them meet your needs. We have also provided a buying guide that contains information on how to research trail cameras and look for the features that a quality trail camera contains. 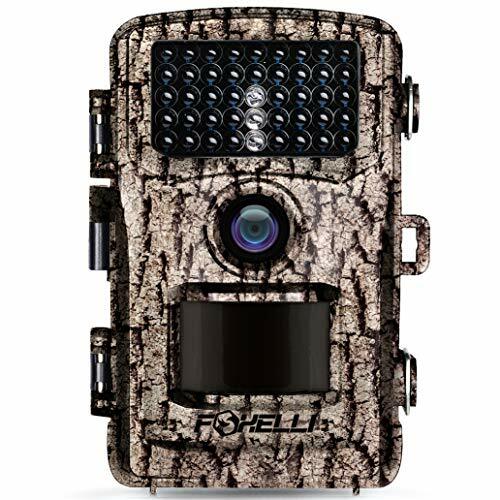 If you are looking for a powerful trail camera that offers 12 MP, vibrant photos and 1080P HD videos along with audio, the Foxelli trail camera is what you need. You can record videos as long as 10 minutes each. The wide angle lens of 120 degrees gives users a huge scope for shooting and capturing footage of all kinds of scenery and wildlife. Features include a 2.4 inch color display monitor for previewing your videos and photos, far range night vision that has up to 65 feet of detection, and also has 42 LEDs that are no glow so you have plenty of night vision. This camera will produce black and white shots taken at night in precise detail as well as vivid color shots during the day. The lightning fast PIR motion sensor has a .5 second trigger and sensitivity that is adjustable so you don’t miss anything while out on the trail or anywhere else you want to take shots. Setting up this camera is super easy and fast. All you need is 4-8 AAA batteries and a micro SD card that can be as big as 32 GB that can be purchased separately and you are all set. 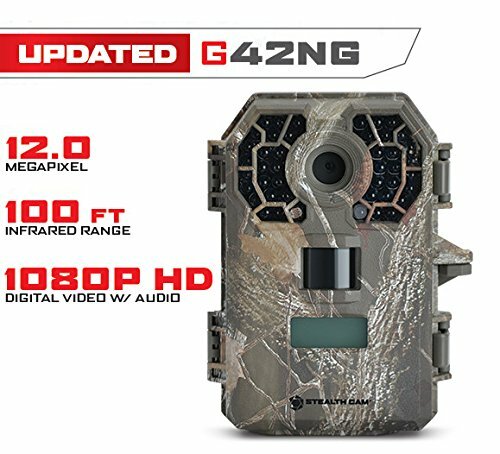 You’ll be able to do some excellent scouting outdoors and capture wildlife in their own habitat with the Stealth Cam G42 trail camera. This great camera offers 10 MP, crisp photos whether you take them at night or during the day. This trail camera can also do video recording from 5 to 180 seconds. Users will experience excellent low light performance so they can view extended distances at night. The backlit menu is intuitive and easy to operate. The built-in SD card holds up to 32GB of memory. You can also do manual shots with a secure lock protection for passwords. Each photo you take with the G42 contains time, moon phase, temperature, and time stamps so you can keep track of when you took each shot. Other features include a time lapse that offers a PIR override, burst mode, and much more. The water resistant trail camera by Browning Strike Force offers users plenty of reasons to love it. This super great, .4 second trigger speed with a recovery time of .8 seconds. The 16MP, high quality camera has a new video processor that gives you 1280 x 720 high definition video clips with audio. You can also take great night photos with this trail camera using the zero blur feature that will take blur free photos from a range of 120 feet at night. The infrared flash also provides excellent nighttime viewing. The long battery life ensures that you have little chance of missing great photo opportunities while you are in the field. The Browning Strike Force Trail Camera runs on 8 – AA batteries that you will need to purchase separately. You will get time-lapse viewer software with your purchase. 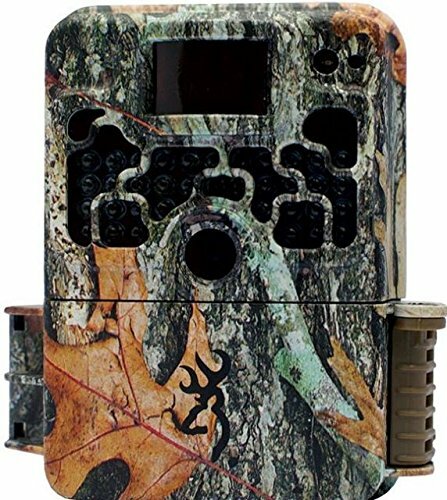 This high quality trail camera has a camouflage covering that allows it to blend seamlessly with your surroundings. You’ll love this compact design and affordable price of the Browning Strike Force trail camera. The three top-rated trail cameras featured above are all high quality cameras that provide outdoor enthusiasts with the ability to take beautiful, crisp, HD photos without missing any incredible wildlife in action. All three offer great nighttime picture taking ability as well as the ability to take HD videos day or night. Taking the time to be prepared for your outdoor excursions by having the right, high quality camera for video recording and capturing nature and wildlife in all its glory will take your outdoor experiences to a whole new level. You never know what you will see when you are out exploring nature. Don’t take a chance on missing some incredible shots. Choosing the right trail camera will give you what you need to make lasting memories of the wildlife and scenery you encounter. Once you are ready to purchase a trail camera, choosing one of the excellent trail cameras we have reviewed above will provide you with the essential tool you need to capture your subjects in their own habitats in video and through photos you can share with your friends and family. If you don’t quite see what you’re looking for, we have listed several more good quality trail cameras for your consideration as well. Choosing the right trail camera involves understanding the different types that are available and knowing what features they offer. It is also helpful to know which ones are better than others so you choose a high quality trail camera that will provide exactly what you need. We have listed the different types of trail cameras below along with some information about each type so you can differentiate between them. Flash Trail Camera – These trail cameras feature an incandescent bulb. The bulb lights up with the press of the trigger. If the trigger is not pressed, the trail camera will act like any other camera. The motion sensor triggers the camera where it begins to record and will snap a picture of the area in front of the lens. Flash trail cameras can take pictures during the day as well as at night; producing color images for daytime shots and black and white images for nighttime shooting. This type of trail camera has a shorter battery life than the others. Infrared Trail Camera – The most recent type of trail camera to hit the scene is the infrared trail camera. These heat seeking cameras will detect the heat of the subjects. Infrared trail cameras light up the LED panel that has been triggered by a sensor when heat is detected. One of the popular benefits of this type of trail camera is that it will snap pictures subtly, not drawing attention to itself or scaring the subjects you are trying to photograph. Infrareds have longer battery lives so you can have the camera out longer. Wireless Trail Camera – This type of trail camera uses a SIM card or WI-FI to send the images you take to your devices instantly like a smartphone or tablet. This is a great camera for surveillance work since you will be able to see anyone on the property that may not supposed to be there instantly. There are several features you will want to consider when shopping for the right trail camera for your needs. We’ve listed these features below. Megapixels – Typically when it comes to megapixels, (MP) the higher they are the higher resolution they will have. Megapixels should not be the deciding factor when it comes to choosing a trail camera. Unless you are looking for super resolution for giant billboard-sized photos, you will not notice much difference between a 4 megapixel camera and an 8 megapixel camera. Battery Life – The battery life of your camera’s battery is very important. If you put your trail camera in a place that gets a lot of activity you could easily end up with hundreds of photos. Some trail cameras can only take 3 to 4 thousand photos from a full battery charge. Others can handle thousands. The size of the battery the camera takes is also very important. One camera that uses D batteries will be more expensive to keep operating than one that uses AA batteries. Photo Settings – One of the most important features you will need to look at is the settings. Depending on the camera model, it may only take pictures once through motion detection and could possibly only take one photo every one or two seconds. If a deer, bear, or some other wildlife creature walks into range but isn’t positioned well, the photo will more than likely be useless. Some other settings that are popular are the auto time lapse mode. This feature allows the camera to take a series of photos at a certain time. It is not dependent upon whether the camera has been triggered or not, it will take the photos when the settings state it should begin snapping. This is a great feature to have if you are setting up your trail camera on a large field or food plot. The camera will capture what is in the field even at a distance. This is a great mode to use if you are searching for turkeys. By using a motion triggered camera you could miss some key elements to how the turkeys enter the field so you can successfully hunt them more efficiently. Trigger Speed – Trigger speed is another important feature. The trigger speed of a camera determines the time that elapses from when the subject enters the frame until the camera snaps the picture. The faster the trigger speed the better your chances are of getting some great photos. Infrared – Shooting great photos during the day is always exciting but when it comes to catching good photos of bucks; that usually happens at night. Using a regular flash at night would instantly scare the deer off, but an infrared camera allows you to take photos at night without the scary flash that will ruin your photos and scare your subjects. Not all infrared cameras are the same; some will filter the light while others send out a beam of infrared light. A camera with filtered infrared can be virtually invisible. LCD Display Screen – If your trail camera has an LCD screen you won’t have to wait until your trip is over before you take a look at the photos. Just remember if you are trying to take wildlife photos, looking at the ones that have been taken is best done back at your truck AFTER you get tons of shots to go through. Standing out where the camera is can allow the animals to smell your scent all over the area and that will scare them and keep them away. Video Capability – Over the last few years trail cameras have advanced pretty significantly. One of the newer features that these trail cameras have is video capability. There are many models that can shoot high quality video. This will increase the cost of the camera but may not add any value when it comes to hunting. Remote Access – With remote access you will be able to send the photos to your email without having to leave home. You’ll be able to get a hold of the photos without disturbing or scaring the wildlife you want to photograph and scout. Remote access is a good idea for those hunting on property that is hundreds of miles away. While remote access will cost more, try to make sure if you really have a need for it. There is a monthly cost to activate the remote access. Another thing to keep in mind is that if your cell phone does not work in the field where you are, it is unlikely that the remote access will work either. Warranty – Warranties are very important and a great way for you to protect this investment. A good warranty or satisfaction guarantee allows you to check the product you are interested in but in a deeper way that is not available on regular sales sites. Although sales sights will give you the description of each camera it will not give you inside information on what the camera is like to actual use the way that customer comments will. Keep in mind that not all reviews and comments are valid, but if you look for trail cameras that have high star ratings and lots of customer comments, you can be confident that you will only charge what is due. Trail cameras are a great way to scout and take photographs of the wildlife that 1.) You are hunting or 2.) You just want to photograph and track. With all of the different brands and models of trail cameras on the market it can be very confusing or overwhelming to figure out which ones are good, which ones should be avoided, and which ones are the best of the best. We have addressed this potential analysis paralysis by doing research and testing and providing you with the three top-rated trail cameras on the market along with a buying guide that will give you the features to look for when you are shopping around. This information will equip you with the tools you need to eliminate the cameras you’re not interested in or that do not fit your needs and allow you to make a confident decision in the right camera for your needs, likes, preferences, and outdoor lifestyle. When you are down to just a couple of choices, be sure to check the customer comments on the final couple of choices you are trying to decide between. Customer feedback can be very valuable when you are unsure of what good information is and what sounds like just hype. Educating yourself on things will prevent accidents from being made and from you wasting your money and time on the wrong camera.